The story almost comes off the rails, but Beetlejuice's charm lies more in the execution. The movie is crammed with visual invention and snappy comedy. For sheer off-the-wall audacity, Tim Burton's demented Beetlejuice certainly demands respect, even if it's more enjoyable in concept than in execution. 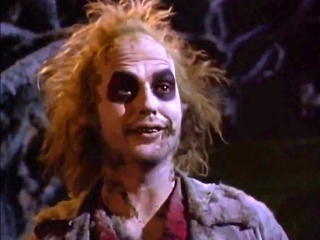 Betelgeuse doesn't fully emerge until the film is half over, but Michael Keaton makes a strong enough impression in the role to explain why the picture is named after his character. [Tim] Burton's marvellously imaginative view of the afterlife as a ghoulish extension of mundane earthbound problems is a visionary masterstroke crammed with wit and invention. Starting with the title, not much about this movie makes sense. That's what's fun about it. Amazingly, it all still feels fresh, even though Burton has since become something of his own franchise since. Much as Joe Dante did in ``Gremlins`` and ``Innerspace,`` Burton delights in creating in live-action format the impossible effects of cartoons and comic strips. Early Tim Burton is creepy, dark fun for tweens and teens. With its sophisticated yet accessible blend of comedy and the macabre, I knew Beetlejuice was likely to be one of those films I would never tire of. But a classic? It's been 20 years. I'm willing to throw that blue ribbon on it. Tim Burton's imagination jumped into the saddle and held onto the bridle with Beetlejuice. ...weird and unorthadox and innovative and clever, but the main thing is that it's funny. One of [Burton's] flat-out funniest films, with Michael Keaton giving a performance for the ages. Beetlejuice means something good: that imaginative artists can bring a fading genre back from the dead.